4. Stronghold spot-on solution DOG. x3 pipettes. Various strengths. Barrier Parasite Repel Spray is a quick acting liquid formulation that rids animals of all types of biting and sucking lice, mites, midge, ticks, mosquito, black flies as well as helping to prevent fly eye. Can be applied to raw, inflamed and irritated areas to help soothe and calm. 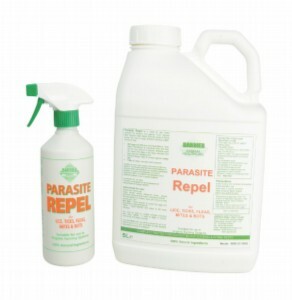 When sprayed directly onto any animal, it will rid the animal of all known ectoparasites for up to 24 hours. Suitable for horses, ponies, cats, dogs, cattle, rabbits and other small pets.